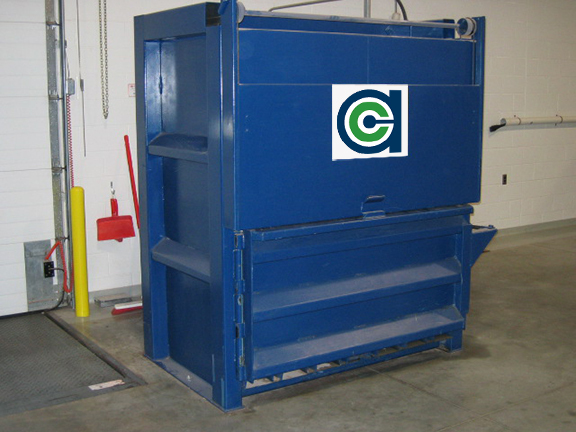 Vertical Baler | AC Waste Services Inc.
For recycling cardboard, plastic, clothing, and other recoverable waste streams. Front of unit bale tie off design eliminates the need for rear entry. Loading made easier with larger feed opening and low feed height. Baler is perfect for tight spaces due to cross cylinder design. Hydraulic ejection system is low maintenance and easy to use. Produces bale weights up to 1,700 lbs. (depending on model). Protected safety switches cannot be easily changed. Design of baler is enclosed and employee safe. Preventative maintenance is simple due to easy access. Key start, full light, and emergency stop button on control panel. Door latch mechanism with gradual release bale chamber. Optional Level 3 Safety Interlock Switch.